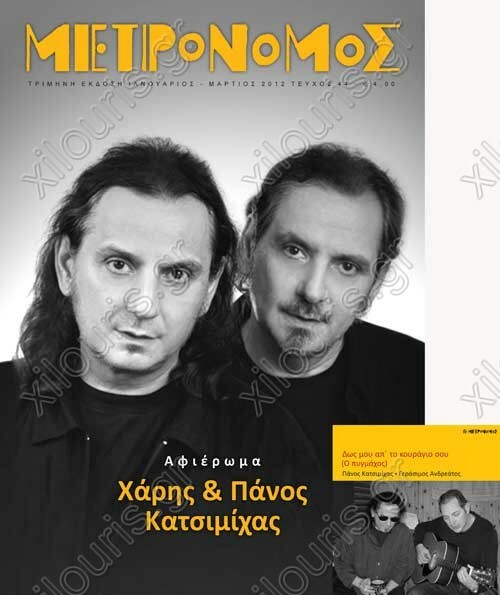 o 44o teyxos tou Metronomou einai eks' oloklhrou afierwmeno stous adelfoys Katsimixa. Gia prwth fora sthn istoria twn shmantikoterwn, apo th dekaetia tou '80 kai meta, tragoudopoiwn ths ellhnikhs skhnhs epixeireitai ena ektenes afierwma sth zwh kai to ergo tous. Mousikologika arthra kai martyries dhmiourgwn kai stenwn synergatwn tous epixeiroyn na fwtisoun tis pollaples plevres ths tragoudopoiias tous (th sxesh tous me to rok, thn paradosh, to laiko tragoydi, thn poihsh k.a.) dhmosieyontas parallhla agnwstes istories gyrw apo ta xronia tous sth Germania, thn prwth tous emfanish sto Festival ths Kerkyras to 1982, thn hxografhsh twn thrylikwn «Zestwn potwn» k.a. synodevomena apo spanio kai anekdoto fwtografiko yliko. To afierwma ksekina me mia vathia proswpikh polyselidh synentefksh twn idiwn twn adelfwn Katsimixa. To periodiko synodeyetai apo ena cd single me ena kainoyrio tragoydi tou Panou Katsimixa pou ermhneyei o Gerasimos Andreatos me ton titlo «Dws mou ap´ to kouragio sou» (O pygmaxos).